Anyway I digress...during sixthform we were given these career appointments and all I could really tell my advisor was that I wanted to go into a field where I help people. It was either that or teaching which I had always enjoyed since volunteering for Duke of Edinburgh. From the three subjects I was studying, my favourite was Psychology but I just wasn’t really 100% sure about the prospect of studying it at higher level, it felt like a huge decision to make at the age of 16/17, like someone asking you ‘Ok you have £24K loan to choose a degree that will shape your future and most likely influence your whole life! !1!’ and it was VERY daunting. I remember hating the fact that I wasn’t one of those people who had their whole future planned out at the age of 10, knowing that medicine is their destiny and nothing else would do... but reflecting on that, life is incredibly unpredictable and most of the people I know who applied for med school didn’t get in, so perhaps it’s not so bad y’know?? Finding the right course for me.. Anyway I went to a couple of open days and there was only one course which really grabbed my attention, and that, of course is what I’m doing right now: ‘Developmental and Educational Psychology.’ It had the perfect mix of interesting content (Psychology and its endless routes and job opportunities) and practicality - the education side of it as I was pretty unsure about whether to go down the primary education route or the simple psychology one - honestly it felt like it was made for me and I was soooo relieved I knew I found the missing piece to the puzzle, which made the rest of A-levels a little bit more bearable because for this Uni and course I didn’t need the highest grades, in fact I achieved a lot higher in my A-levels than I needed to get into that University, but as I didn’t want to live away and also because the course was so perfect and actually made me really WANT to go to Uni, I chose it and don’t regret that decision. The first year of Uni was pretty good. Half the course felt like in-depth revision from A-levels, but the other half consisted of education modules in which we looked at the education system and the history of it. One of my favourite modules was ‘Psychology in Practise’ which had many different tutors who taught us about the fields in which psychology reaches and if we were to go into those fields, what our roles would be. I found it so interesting learning about how much Psychology impacts almost every area of life, from sport to education to the work place and the health field. 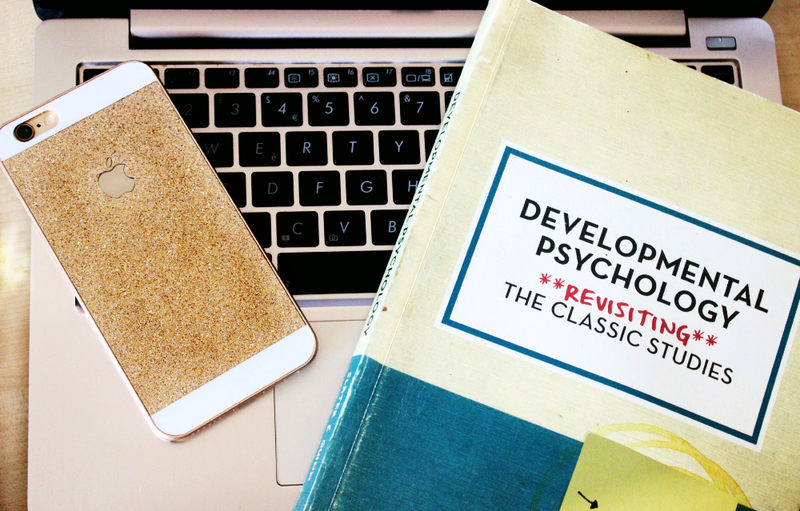 As the course is focused on developmental psychology, my fellow peers had a separate module in which we focused on the classic psychologists and studies involving developmental learning. Those were some of my favourite seminars because working with children is something I do in my part-time job and learning about their development and enhancing my understanding was really interesting, something I genuinely enjoyed doing. Of course the worst part of first year and second for me was (is??) research methods. That is one thing I will warn anyone who is thinking of taking a Psychology degree course, the use of SPSS and statistics is unavoidable (believe me, if there was a way I would have found it by now). I was always sure that I wanted to commute to Uni and I know for a lot of people the whole moving away and being a student in a new city thing is really important, but the whole student lifestyle just is not for me. Call me old fashioned but there is nothing better than the comfort of my room, in my house with my family. Plus I found the prices to live away horrendous, I mean we are already being forced to pay £9K a year and why would I want to add a couple more big Ks to live in a small, uncomfortable room with potentially horrible people as neigh- okay you get my drift! I wrote that half jokingly - I totally see the advantages of moving away for uni and becoming independent, as well as it being easier to make friends and have people there for support with assignments and stuff. So y’know there are pros and cons for both, I myself don’t regrets staying home at all and for the record - it’s alright to commute if that is what you’re comfortable with. Plus I have a job that I love and no student accommodation is worth leaving that for ._. Also a HUGE plus about commuting is driving, my route to uni takes about 35-40 minutes in the car and its such a beautiful drive, I love having that time to relax and just think about everything y’know? Plus after a year and a semester of commuting via train and bus it is G L O R I O U S to be able to drive, it really really is! To answer Amina’s questions about my favourite thing about my uni - probably two of the lecturers, they really really make me want to do well and work hard, they make their lectures interesting and they’re also very happy to help when you need it - honestly guys take as much support and you can find bcos 9K OK!!! 9K! but yeah those two lecturers and also the timetable, I love that I’ve only had one 9am start a week - winning!! My favourite thing about my studies, well I already answered that above, but to sum up its the fact that my course is literally perfect for me (apart from SPSS). I hope that post answered any questions you may have had, quite a long ramble and I was a bit unsure about how much to write and how many people will probably fall asleep reading this, but there ya go - you lovely ladies asked for it so I hope it’s what you wanted I guess!